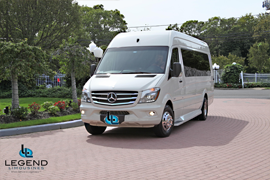 Comfortably accommodating up to 13 adults, Legend’s Black Mercedes Benz Sprinter Limo Bus has a 12 passenger capacity max rating. A sliding door and molded step make entry and exit of the vehicle very easy, especially for those with mobility issues. The interior is elegantly designed with a rich hardwood floor, beautifully stained dark wood bar, and dark wood accents throughout. The ceiling has just the right amount of suede and stainless steel, giving the interior an ultra-modern feel. Color changing lights accent the “Maybach” ceiling and can be arranged to either cycle thru a range of colors, or remain constant on a specific color of your liking. Black seats with silver diamond pattern inserts give the interior a very clean and sharp look. There is a 35″ Flat Screen Television on the back wall, and a 35″ Flat Screen Television on the front wall.